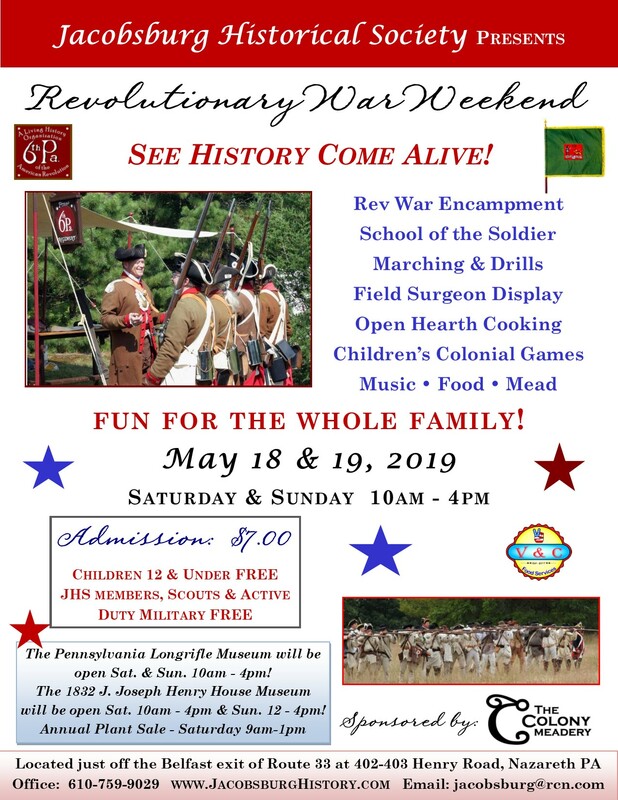 We are very excited to host our first American Revolutionary War Living History Weekend presented by the 6th Pennsylvania Regiment and the 1st Pennsylvania Regiment. With over 40 years of experience in Living History, the 6th Pennsylvania is the standard in today’s reenacting community. The 1st Pa. tells the story of America’s fight for liberty through the battles of the 1st Pa. See history come alive as the 6th Pa. and the 1st Pa. present the School of the Soldier with marching, drills, camp life, open hearth cooking, rifles of the Revolution display, children’s colonial games and a field surgeon display. There will be sutlers of colonial wares, mead tastings with the Colony Meadery, and food provided by V&C Food Services. The Boulton Historic Site will be open to the public on Saturday May 18 and Sunday May 19 from 10:00 AM to 4:00 PM for this very special event. Adult admission is $7.00 with free on-site parking. Children 12 and under, JHS members, active duty military, and scouts are free. Fun for the whole family! The Pennsylvania Longrifle Museum will be open for tours Saturday and Sunday 10:00 AM–4:00 PM. The 1832 J. Joseph Henry House Museum and Summer Kitchen will be open for tours on Saturday 10am-4pm and Sunday from 12 noon–4:00pm. Our Annual Plant Sale will also be on Saturday, May 18 from 9:00 AM–1:00 PM behind the J. Joseph Henry House near the Craft Barn on Schoeneck Avenue. We will have a wide variety of perennials, annuals, and house plants. This is a great fundraiser for the JHS Gardens and you can find some good deals for your indoor or outdoor garden areas. Are your plants pushing you out of the house? Our Garden Committee welcomes donations! Click here to print this flyer!